In parts 1 & 2 we learned some basics about importing, conforming and tweaking the white balance of our footage to make it ready for transcoding. In this final part of the Cinelog-C for DaVinci Resolve Basic User Guide we will create a separate, high quality Cinelog-C Log Master for each shot. The can be edited, graded and/or archived. We will also render a REC709 H.264 video file (referred to as Dailies or Rushes) for quick viewing by others and create Easy Setup presets for faster a Transcoding workflow. We begin by selecting the last Resolve screen - DELIVER. 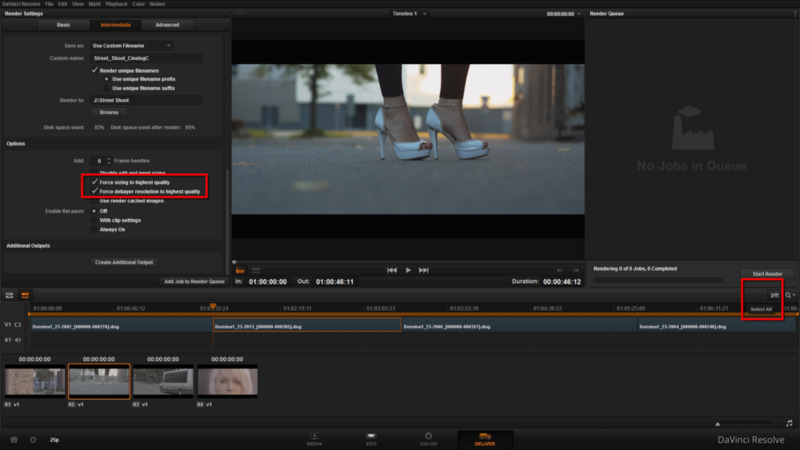 To set-up our Render Job Preset we will use the Intermediate Tab (highlighted with a red box in the image below). The Basic tab does not allow us to change debayer quality and the Advanced tab has more options than we need for this particular job. 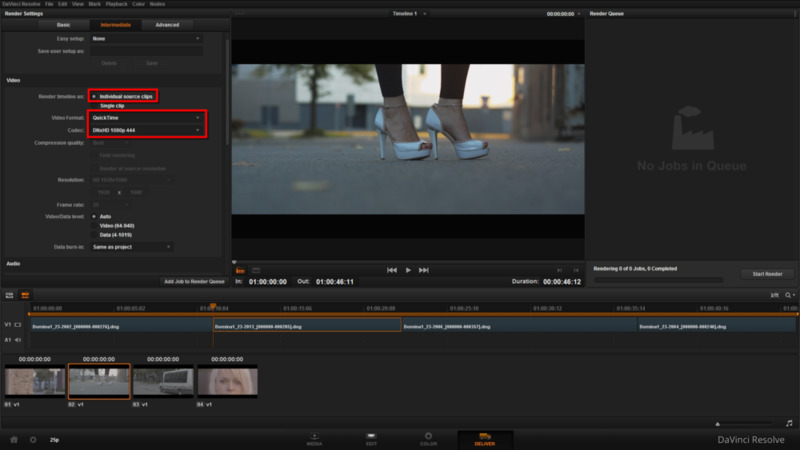 For creating the Log Master Intermediates, we need to render separate video files for each of the shots on the timeline. These can be edited and color graded in Resolve or another app such as Final Cut, Premier Pro, Vegas or Avid. The Intermediate Log Masters will be much easier to work with than the original DNG images, especially in other apps that may have limited or no support of the DNG or Cinema DNG format. We begin by selecting the Intermediate tab (Intermediate in the Resolve Deliver panel means Intermediate level of settings). We also need to render separate files for each shot on the Timeline so change Render Timeline As: to Individual Source Clips. Next, we select the Video Format and Codec. For this job, and because I am working on a Windows system, I will be rendering to 10bit DNxHD 220 in a QuickTime container. The choice of codec is very important and for this Intermediate Transcoding job there is an absolute minimum. The Codec must be at least 10bit 4:2:2. Never use an 8-bit codec for this task! 8-bit codecs are not large enough to store all the information contained in Cinelog-C. 8-bit codecs are primarily used for final delivery i.e. H.264 (known as a deliverable). If storage is not such a big issue you should consider rendering with a very high bit-rate codec such as DNxHD 444 (PC) or ProRes 4444 XQ (Mac). These will produce very robust intermediate video files that can withstand extreme color grading. They are also perfect for archiving and good enough for you to wave goodbye to your original raw files! A Cinelog-C encoded file, compressed with these codecs, will hold enough color information that, when transformed to Scene Linear values, are visually identical to a debayered, balanced DNG file - in other words, they can be viewed as lossless. These codecs are also supported for image capture in high-end cinema cameras such as the ARRI Alexa and used extensively in professional post-production. The codec choices available to you will depend on the platform you are working on (i.e. OSX, Windows or Linux) and the codecs you have installed. Resolve comes with most professional codecs. DaVinci Resolve on Mac and Linux supports all Apple ProRes variants. Apple ProRes (not to be confused with FFMpeg ProRes - a lower quality version) is the Industry Standard Codec and would be my #1 choice but, as I am working on a Windows system (my personal preference), I do not have ProRes as an option and must choose something comparable - My choice for this job is DNxHD 220 as it is 10bit and holds up well for moderate color grading. I could also opt for DNxHD 444, MPX OP1A, Cineform 10bit, Grass Valley HQX or others that I have installed. I also know that the editor who will be working on the final video, is also on a Windows system and will be editing in Adobe Premier Pro. The final video will be 1080p and 1080p is the largest frame size DNxHD can render. The 1080p upper limit of DNxHD is restricting, especially when working with UHD/4K footage but Resolve will soon be supporting the new, resolution independent DNxHR codec. If extreme color grading was planned I would definitely render with a much higher bit rate codec such as DNxHD 444 (PC) or ProRes 4444 XQ (Mac) and, if VFX was involved, I may even chose to add a Cinelog-C to ACES colorspace transform LUT to the output and render (big) .EXR floating point ACES files! - but as this is a basic video production that will be delivered in 8bit REC709, the 10bit DNxHD 220 codec will do just fine! Like so many things, codecs are another big subject and not something for this basic guide. If you want to discover a little more about codecs and see how the main ones perform, Cinelog user Steffen from Hackermovies.com has written a very revealing article - It's well worth the read! With the codec and video format selected, the next option presents us with a dilemma. Do we choose Auto, Video or Data Levels? Levels basically embed metadata to describe whether the White and Black levels of te video are legal (64 -940) or full (4-1023) range. The values are shown as 10bit (0-1023). The general rule here is that deliverable formats i.e. 8-bit H.264 / DNxHD 36 etc, that are final production videos, should use Video Levels. Data Levels are intended for 10bit output and what we will use for our Log masters. Resolve is intelligent enough to know which Levels to use for each codec/ Leaving this on Auto is a good idea unless you specifically need to override the embedded levels. There is no Audio associated with this file so I don't need to enable Audio in the settings. If your Video does have Audio you should enable it and set the output to the highest quality you need. 16bit 48Khz is broadcast industry standard for video. We will look at Audio in Resolve in more detail in a future tutorial. Next, we can give our video files a prefix or suffix - This helps with identify them by name, especially if they are stored with other files. Here I have chosen to add a suffix of Street_Shoot_CinelogC. I have also selected a location to write the files to and created a new folder called Street Shoot by right+clicking on the drive letter in the File Browser pop-up window. The final things we need to change relate to quality. To ensure we render at maximum quality we will force Resolve to use its Highest Quality Debayer and Scaling algorithms. The last thing to select are the actual files we want to render. We want to render every shot on the timeline so we click the file selection button (on the right of the screen) to select everything. We are now ready to render but before we do, let's save these settings as an Easy Setup preset that we can reuse for our next transcoding jobs. Scroll to the top of the Intermediate panel and enter a descriptive name for your preset. It's a good idea to include the codec, bit depth and frame size in the name. OK, that's nearly it - Click on Add Job to Render Queue at the bottom of the settings panel. This will create a new Job (seen top left). Now click on the Start Render button and go get a well earned drink! If creating the Log Masters was your goal you can stop here but now is a good time to make an unedited REC709 H.264 Daily that you, the director, the actors, the editor or just a friend can watch without you having to explain the look of Cinelog-C.
We could make our dailies video using the same project by adding the Cinelog-C to Cinelog REC709 LUT to the 3D Output Lookup Table slot in the Lookup Tables Panel and creating a new Render Job for H.264 (There is already one in Resolve's default Easy Setup presets) but let's use the Log Masters we just rendered instead - It's a good way to check them out! Create a new Project by clicking on the Home button (bottom left) to open the Project Manager window. Now click on the + button in the Project Manager window to create a new Project - I've called this Street Shoot Dailies. Double click on the newly created project to open it. We need to set up the project again but rather than changing all the settings let's just modify the Preset we created in Part 1 of the Guide - afterall, it's the same frame rate, frame size etc. From the Presets menu - Select the Preset we created in Part 1 and click Load then click on the Lookup tables panel and remove the Cinelog-C to Cinelog REC709 LUTs from the 3D input Lookup Table and 3D Video Monitor Lookup Table slots. When we made our Log Masters we only wanted to monitor in REC709 but now we want to render with the REC709 Lut so add the Cinelog-C to Cinelog REC709 LUT (or maybe a Cinelog Film look Lut) to the 3D Output Lookup Table slot. Close the panel by clicking the X (top left of the panel). Rather than go through each step regarding importing footage and adding it to the timeline that we covered in Parts 1 & 2, I will skip ahead to the COLOR screen for a quick check in REC709 colorspace. OK, it looks identical to how the Raw timeline looked under the Cinelog-C to Cinelog REC709 LUT - only now it's debayered, scaled and properly white balanced DNxHD QuickTime files instead of those heavy-weight raw DNG files. It even plays back smooth - nice! Lets jump to the DELIVERY tab and render a H.264. I should point out that while making this guide I spotted an issue with Resolve 11 after creating the Dailies Preset. When the Cinelog REC709 LUT was added to the 3D Output Lookup Table slot in the LUT panel, the image looked too saturated and not how it did when it was applied to the raw timeline previously. I presume this is a memory issue or possibly a bug in Resolve 11 but it was easily remedied by saving the project, closing and reopening Resolve and reloading the project. I quickly setup a Render Job, this time in the Basic panel - selecting QuickTime/H.264 as a Single Clip so it will write only 1 file with all the shots. It will render to a sub directory I created in the Street Shoot folder called Dailies. All that's left now is to hit the Start Render button! Thanks for taking the time to read this Guide. It will be updated regularly. Any updates, additions or amendments will be listed on an updates page so you don't need to read everything again to find something new.